Costa Caleta, also known as Caleta de Fuste is located centrally on the eastern coast of Fuerteventura and is an attractive purpose built resort with no high rise accommodation. Popular with families and couples, holidays to Costa Caleta offer peace and relaxation with year round sunshine. The sheltered cove with its imported Saharan sand and safe bathing attract those with young children. 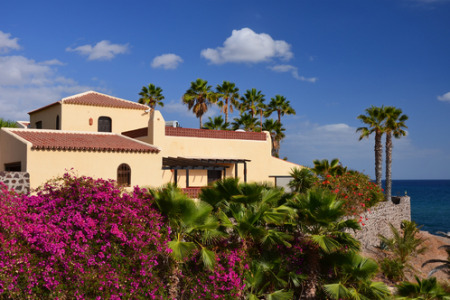 Holidays in Costa Caleta can be enjoyed at any time of year so if you're looking for winter sun, a sandy beach, water sports and golf in an upmarket resort, our cheap Costa Caleta holidays are worth considering. With laid back days and mellow evenings Costa Caleta holidays are a good winter tonic. The resort also offers a wide range of recreational activities including a spa centre, fishing, sailing and golf, and there are several attractions in the vicinity. You'll be amazed at our selection of low cost Costa Caleta holidays where quality has not been sacrificed to price.